The Bow river is one of the major river systems in Alberta. It flows through many cities in the southern part of the Canadian province including Banff, Canmore, Cochrane and Calgary. Starting at bow lake which is fed from the run off of bow glacier this river runs a short but busy 654 km before meeting up with the old man river and creating the South Saskatchewan river. The water that fills the bow river is made up of 80% snow pack and 20% rain fall. Along the 654 km of the bow and its tributaries there are 11 hydro dams supplying electricity, drinking water and everyday living water to all the cities, towns and villages. Also supplying large amounts of water to livestock farms much of the water that runs through the bow is being used to sustain not only humans but a large variety of wild life. Some of the wild you can find through out the bow valley are Bears, Cougars, wolves, many types of north American ungulates and small mammals. The waters are filled with a wide variety of trout, mountain white fish, and northern pike. The bow river has also been argued for years on the claim of being the best trout fishing location in the world. With these bold claims and with the river supporting so much life, The big question is how is the overall health of the bow river? Fishing the bow river is an amazing experience with a wide variety of species all along the 654km it makes a fantastic fishery for any type of angler. Although fly fishing is the most popular way to hit the river spin casting works just fine. If you are thinking of hitting the river with your fly or spin rod, try some of these lures and techniques. When looking for spots to fish on the bow, look for pools or slow-moving water. Work your lure near the bottom as the trout will feed there. If you find some nice pools or a bend with some slow-moving water fish those spots with confidence. If you are fishing with a indicator or hopper dropper cast up stream and let your line float downstream keeping an eye on the hopper or indicator looking for any subtle movement. Remember if you are not occasionally hitting bottom then you are not going to catch fish. When you find yourself a nice spot on the river look for current seams as those are indicators that there is a structure, and fish love hanging around structure. Be sure to not disrupt the water when you are fishing as you do not want to scare the fish away. Olive and Black are trusted colours when hitting the bow so when shopping for lures keep that in mind. If you are going to Huck bugs lift up a rock and see if you can match the hatch, but all the lures and techniques listed are sure fire ways to hook into a bow river beauty. Some locations that you can try if you have no idea where to go are Mckinnon flats just south east of Calgary, Fish creek provincial park located right in Calgary, or the sue Higgins dog park also in Calgary. There is also lots of great locations in Banff national park, Canmore, and Cochrane. 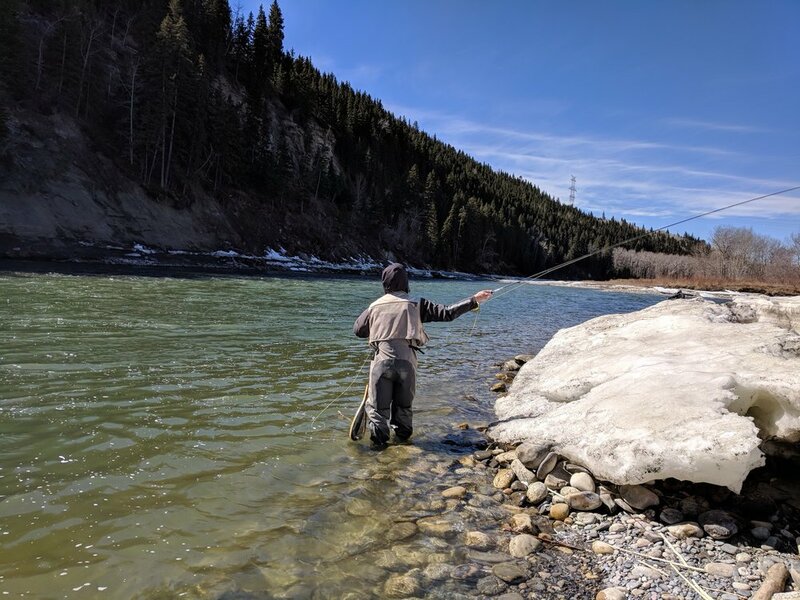 The bow river flows through many wildlife zones so when fishing please check for licensing and regulations of the spot that you decide to get your rod wet in. Just like many major rivers the bow is fantastic for supporting life and amazing for recreational use. With lots of hiking, fishing and paddling options this river is labeled the most active river in Alberta. But just like uncle ben said “with great power comes great responsibility” so it is up to the ones who use the rivers water to live, fish, and enjoy to keep the waters clean and to use only what energy you need. We must take care of our rivers now so that our future generations can enjoy them the way we do.